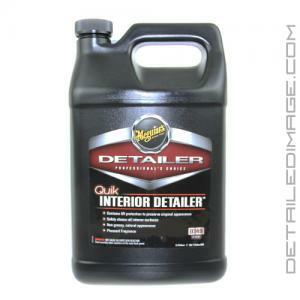 Need an interior cleaning product that can do it all then try the Meguair's Quick Detailer Interior. Quick detailers are normally associated with the exterior but Meguiar's defies convention by developing a unique product to help you clean your entire interior. Use it to clean anything plastic, vinyl, leather, rubber, metal, and audio / video equipment. This comes in handy for places such as the doors, dashboard, console, doors, seats, trim and so much more. It gently cleans all of those areas to remove dust, dirt, human oils, while leaving no residue behind. It also leaves a great fresh scent so not only does your interior look freshly cleaned it smells like it to. Use the Quick Detailer Interior inbetween full details or for quick touch up work. We recommend you keep this bottle inside your car so you can always do a quick cleaning whenever needed. After just one quick wipe down all of the interior will look new and revitalized. Get better results in less time with the Meguiar's Quick Detailer Interior. Pair with the Meguiar's Quik Interior Detailer Bottle and the DI Accessories Chemical Resistant Spray Trigger for easy dilution, storage, and usage! With Meguiar's Quik Interior Detailer you've got one product that safely cleans interior plastics, vinyl, leather, rubber, metal, and even audio-video equipment! [It] leaves a clean, natural finish. Meguiar's unique formula also features sunblocking and sunscreening agents for improved UV protection and provides a fresh, clean scent. 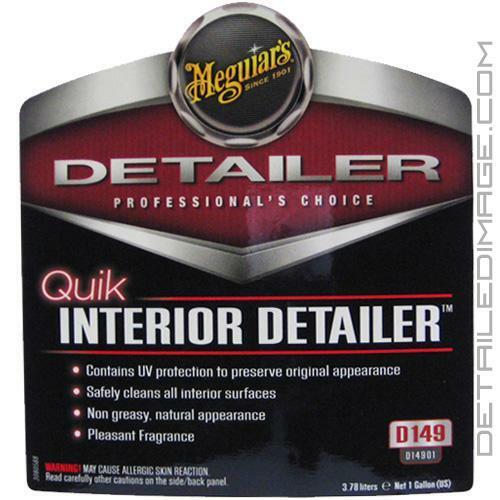 I have been using Meguiar's Quik Interior Detailer for years now, and use it every single time I clean my own cars as well as every vehicle that passes through the Esoteric garage. It's one of my all-time favorite detailing products and one that everybody should have in their detailing arsenal! You practically live in your car and with Meguiar's Quik Interior Detailer you can quickly and easily keep it clean. Quik Interior Detailer is the fastest way to safely clean interior plastics, vinyl, leather, rubber, metal and even LCD and navigation screens. The gentle, high-lubricity formula cleans quickly, lifting off dust, dirt, grime and spills, restoring the original appearance of all interior surfaces. DIRECTIONS: SHAKE WELL. For best results, apply to a cool surface. Mist onto one section at a time. Quickly spread product with a soft, clean 100% cotton terry cloth towel or microfiber. Turn to a dry portion of towel or microfiber and wipe surface dry. Do not let product self-dry. Return to damp portion of cloth for each initial wipe. Note: Please refer to vehicle and aftermarket equipment owner's manuals for specific surface care instructions. Not for use on suede. Store and transport in secure upright position. Leaves the surface clean, not shiny and slick. Works great on touch screens and gauge clusters, will not leave streaks with a clean towel. I even use this on cloth sometimes for spot treatments, seems to soften Wendy's chili stains easily enough. For the price, it's hard to beat and compare really. If you're looking to simply restore the look of your interior when it was new, this is all you need. If your looking for that clean new car look. This is you want. It wipes on and off easy with no streaking.It does clean pretty good and it wont leave a film behind. The smell is pleasant.